The purpose of this page is to outline an assignment that allows students to dive deeper into understanding the tools of Rhetoric and how it is used every day to persuade us. To start off, I have come up with a list of terms that consist of the most common words used when applying Rhetoric Analysis. After defining these terms, I will take you through a paragraph by paragraph breakdown of a student paper in which the student was told to cross analyze two separate articles and compare and contrast their uses of Rhetoric. For ease of use, I have broken down the paper into three main sections including Ethos, Pathos, and Logos. 1. Author-The person or people who wrote the article. 2. Topic- What the text is about. 3. Audience- Who the author is addressing. 4. Purpose/Aim- What the author is trying to accomplish in writing the text. 5. Occasion- What prompted the writer to write in the first place. 6. Argument- What kind of assertions does the author try to make related to the rhetorical situation and how this relates to the audience addressed. 7. Evidence- How the author supports his argument with examples and explanation. 8. Structure- The order in which the author presents their information. 9. Style- The type of syntax the author uses and how it relates tot he purpose or the audience. 10. Ethos- The author establishes credibility or authority on the subject matter to get the audience to trust their argument. 11. Logos- The author tries to persuade their audience by presenting a reasonable series of arguments supported by evidence and examples. 12. Pathos- The author uses emotional appeal or language in order to persuade their audience. The following paragraph is an introduction to an example of rhetorical analysis. Follow the paper throughout this article and use it as an example of effective rhetorical analysis. "CNN is a news show that seems to strive for a younger audience and seem to take a more liberal outlook on everything that happens in the news spectrum. Fox News however, targets a more mature and wealthy audience, and because of this they thrive on a conservative opinion. “Bill Clinton delivers emphatic endorsement of Obama, saying America is better off” by Judsen Berger and Cristina Corbin is an article that can be found on Foxnews.com about the speech that Bill Clinton gave at the Democratic National Convention (DNC). This article uses Logos with support from style, and an interesting lack of Ethos to try and persuade their main point which is that Clinton shared a great speech, but that does not mean Obama should be president. On the other end of the spectrum, “Bill Clinton, the reverse Clint Eastwood?” by David Rothkopf is an article found on cnn.com that also talks about how great Bill Clinton’s speech is and its effects of the speech on the Obama campaign. Rothkopf’s article uses Ethos and Pathos with a lack of Logos in order to spread the message that Clinton’s speech just helped Obama win the race. Both of these articles are completely different in opinion and rhetoric, but Rothkopf’s use of emotions and credentials at the top of the article (Pathos and Ethos) give the reader more attachment, and trust in the author, and that is why it is a more effective article in expressing its views." As you can see from the student's intro, they are comparing and contrasting the rhetorical tools used in articles found on the sites CNN.com and FoxNews.com, and then they evaluate which article had more rhetorical appeal and why. This allows the student to not only have a greater grasp of the definitions of these rhetorical tools, but allows them to dive deeper into the subject matter by having to pick a side on which article works better. Since they are forced to decide which article seems to work better for the audience they address, this has them trying to define the "Why?" question, as in "Why do we use this certain type of rhetoric?". Once the student is able to understand the answers to this question, they will have a better grasp of why people use rhetoric, and just how effective it can be. Ethos, as defined by Stephen Wilhoit, is when authors, “try to persuade readers by appearing fair, balanced, and informed …” (Willhoit 122). “Bill Clinton, the reverse Clint Eastwood?” by David Rothkopf, and more generally CNN.com, uses this form of persuasion right from the beginning by allotting for a mini-biography and picture of the author(s) to be before every article. Before any opinion can even given out, the reader is addressed with an editor note that states, “David Rothkopf is CEO and editor-at-large of the FP Group, publishers of Foreign Policy Magazine, and a visiting scholar at the Carnegie Endowment for International Peace.” This is accompanied with a picture of Rothkopf on the left side right next to the starting paragraph of the article. The audience now already knows the accomplishments and title of this author, and exactly what he looks like. This is a technique that leads the audience into trusting the author based solely on his past experiences and appearance without even looking at the actual topic of the article. CNN will have no problem persuading people towards their corporate opinion if most of the people who visit their sight feel as if they have a personal connection with the author; this is probably why one of these “mini-bios” and pictures of the author can be found on most of the articles on the site. Just because Foxnews.com missed out on the effects of Ethos does not mean that the article itself has any less validity or swaying power. Foxnews.com did miss out on this user friendly tool because the only real way to find out any information on the authors of their articles is to Google their name and find them in a list of Fox Employee archives in some hidden corner in their website that is nearly impossible to find from the main page, but this does not mean that their entire article is now useless and without and persuasion. In the first body paragraph above the student first informs us that they understand the concept of Ethos by giving us a definition from Stephen Wilhoit (as stated above). The student does a good job at not only defining Ethos and its practice, but by looking at details in the article that a typical audience member might not give much thought to. Since the students have been informed about the different types of rhetoric, it is great for them to see the different ways in which authors use rhetoric in the details that originally were thought to mean nothing at all. As a teacher, or future teacher. It should be your goal to get to the level that this student is at. What that means is that you do not only want to make sure the student understands the basic definition and some examples of practice of Ethos, or even Pathos and Logos, but you want the students to be able to look at specific details of a site or book and be able to see why they are attracted to these specific writings over others. The reasons that they like these sources of media has a lot to do with the rhetoric approaches that the author chose to pursue. “Bill Clinton delivers emphatic endorsement of Obama, saying America is better off” by Judsen Berger and Cristina Corbin uses a different technique called Logos to show their readers how they believe they should interpret this speech by Bill Clinton. Logos is defined by Stephen Willhoit as, “when authors try to persuade readers by presenting a reasonable series of arguments supported by evidence and examples…”(Willhoit 122). The entire article is written almost as if it is just a statement of facts. They use a unique style in the article, using brief paragraphs and quick facts in order to seem un-bias but still sway the thoughts of the reader. They write, “Just four years ago, Clinton's wife, Hillary Clinton, was battling Obama for the party nomination, and the former president was among Obama's toughest critics.” Then right after states, “Now, Hillary Clinton is Obama's secretary of state, and Obama Democrats need the former president's star power and fundraising prowess as much as Clinton, who clearly still enjoys the spotlight, needs the party.” These are listed as if they are facts that cannot be proven untrue, however in all actuality in between the facts there is rhetoric used to get their true opinion across. For example, in the article the point is brought up that one may argue that Bill Clinton did not dislike Obama when his wife was running against her, but instead just knew that he would have to be defeated if his wife were to win. This counterargument is never brought up in the FoxNews article because they used Logos to state the quote as if it was a factual example, and not one open for interpretation. Although the David Rothkopf article and the Judsen Berger and Cristina Corbin article have used two very different techniques there is something that they both seem to use that is similar and effective in both positive and negative outlooks of Bill Clinton’s speech. The best thing we, as teachers, can take away from this section of the students paper on Logos, is just how prevalent rhetoric is in today's society. In these modern times it is easy to find someone trying to persuade you to either pick them for some event, or give them money, because this rhetoric is used in almost anything used to grab your attention. This student looks specifically at the article itself written about former President Clinton's endorsement of President Obama, and how the articles state their opinions on the speech as facts, without acknowledging the possibility of any other opinion or counter argument. As teachers it is good for students to understand this point for two reasons. The first reason being that because of this the student obviously understands the purpose of Logos and how it is effective. Just because the FoxNews article is stating their opinion as a fact does not make it one, but it does add a persuasive pull to believe it as true. The student understands this, and brings this up in the paragraph, saying that in order to be un-biased it must provide both the positive and negative outlook on the speech. The second reason that it is important that the student brought up the point of counterarguments is because this is a tool that students must bring up in most of their papers from upper high school levels and on. It is important for students to know that not everything stated as a fact (by using Logos) is necessarily a fact. If a student understands this then they will be able to provide counterarguments in their own future papers, which will provide better analysis overall. To sum it up as a teacher Logos is important to teach because it provides a new lens to the student which allows them to see things not just as they are stated, but to be able to question the sources behind these "facts". Writing in order to persuade the audience’s emotions is the last of our “holy trinity” of rhetoric tools called Pathos. In the CNN.com article by David Rothkopf the entire style and writing of the article uses adjectives and adverbs in order to paint a glorious picture of the speech, to give it a positive spin for the audience and to get them to realize how effective the speech was. In the opening paragraph of Rothkopf’s article “Bill Clinton, the reverse Clint Eastwood” makes a positive image when he says, “- As Bill Clinton walked out onto the stage of the Democratic National Convention last night, there was love in the air. Television cameras scanned the faces in the crowd …regardless of their ages or where they came from, was seeing again the person who first stole their hearts.” These are not the images written by someone who wants the crowd to dislike Bill Clinton. The words “love” and “hearts” were written to gain a connection between the audience and the former president, in order for the readers to trust Clinton and remember how good of a man he was. Foxnews.com tries the same trick but with a different spin on it. In the closing paragraph, that has almost nothing at all to do with Clinton’s speech, in the article ““Bill Clinton delivers emphatic endorsement of Obama, saying America is better off” by Judsen Berger and Cristina Corbin it states, “That speech [Obama’s], … has been moved from the Bank of America Stadium … a considerably smaller venue and the decision to hold the president's address there means thousands of Obama supporters who had been planning to attend will be left out.” The reason that Berger and Corbin put this in the article is to pull on the heartstrings of the audience. This paragraph is essentially blaming Obama and/or the DNC in a whole for moving the speech to a different location so that people who paid to see the speech will now miss out. Although there are probably numerous reasons as to why the speech had to be moved, the article focuses on this particular detail in order to anger the audience ad Obama and try to make them see the president in a negative light. This Pathos is less effective than that of the CNN article, because the situation addressed has nothing to do with the main theme of the article, which makes the fact seem off topic and of no immediate interest of the audience, unlike the CNN article which uses direct language to invoke emotional response. Pathos, in my opinion, is the most important detail of Rhetoric that teachers need to teach their students. It is the most prevalent, and is the driving reason people like Roosevelt, Caesar, Lincoln, and even Hitler rose to power. Pathos, as defined by Wilhoit and by the student in the example, is the use of emotion in persuasion, and seems to be the most common among media because it is the easiest to do. As the student says in the example, simple word choices such as "love" and "hearts" are specifically chosen in articles in order to persuade the audience to like a certain person or thing. As teachers it is our job to allow students to see that these tactics are used everywhere from Presidential speeches to bullies trying to "get a rise" out of their victims. We must teach students that there is a working method to this madness and that one must always remain emotionless when writing a sensitive article like the ones that the student reviews in his paper. In closing, it is important that teachers teach rhetoric for many reasons, the main one being that it allows them to do their research and reading with an open mind and be able to see, and in turn ignore, any attempt at trying to persuade them to see things the way the author intended, even if their views may be wrong. 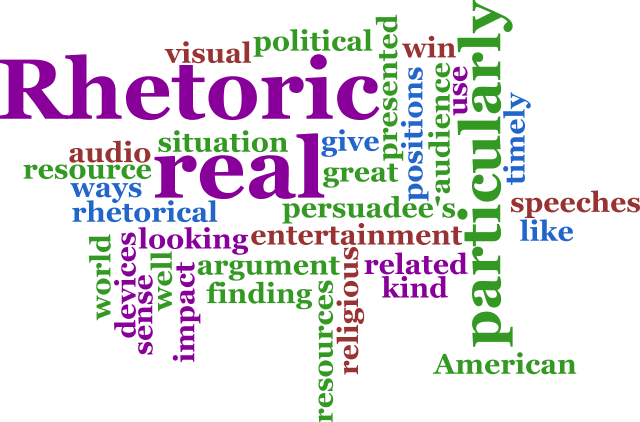 It is also important to teach rhetoric because it is a tool that is used in much bigger categories such as Genre and it is found in Ethnographic Analysis as well. If you are following this guide in order to create a lesson plan step by step, please proceed by clicking on the Genre link. 1. All definitions thanks to: Wilhoit, Stephen. A Brief Guide to Writing from Reading. 5th ed. New York: Longman, n.d. Print. See also What is Rhetoric?